So when we did get to order, we ended up picking one dish each. I ordered in Cantonese and the manager was so impressed, he threw in the congee! I knew my Cantonese-ordering skills would come in handy! 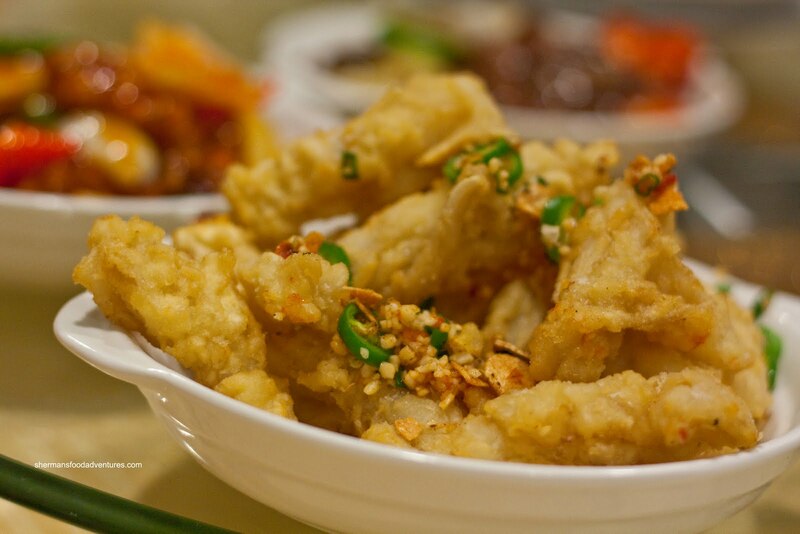 So, we started with the Fried Squid. These were wok-tossed in green chilis, garlic, green onion and salt. There was a nice kick to them; however, the squid itself was too soft. There was none of the good chewiness we associate with squid. Okay, the next dish, I secretly love. Don't judge me, it's the Sweet & Sour Pork. Milhouse ordered it like he usually does. It elicited much humiliation and laughter. Hey, don't knock the dish, it may be very "North American"; but it is indeed a real Chinese dish. When done right, it's tasty. This one was nearly tasty. 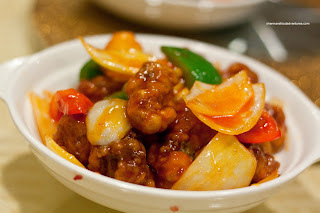 The pork itself was fried nicely in big chunks; but the sauce was not very flavourful. Now the next dish is a da lang classic being the Fried Silverfish. Don't be alarmed here, it's not the same creepy crawlies found in kitchens. Rather, they are actual small fish that are coated with flour and fried. 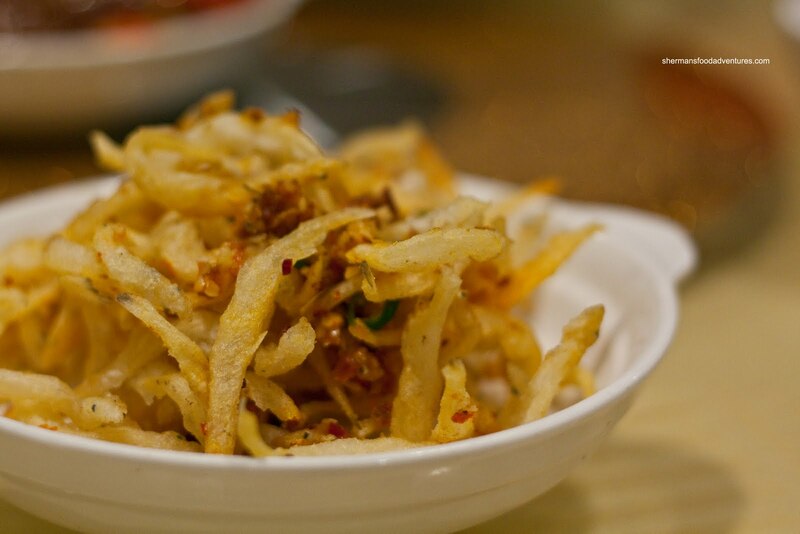 Then, much like the squid, are wok-tossed in salt, garlic and chili flakes. This is best dumped directly into a bowl of congee. It adds both flavour and texture. These ones were good, if not modest in quantity. The award for the oiliest dish had to go to the Satay Beef. It arrived glistening like a pubescent male's forehead. Further examination led to a pool of oil at the bottom of the plate that would make lard jealous. It made for a really greasy eat. 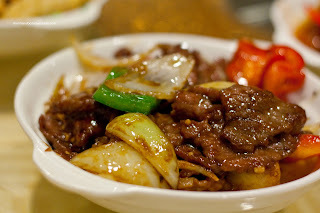 Despite the flavourful tender slices of beef, I personally didn't enjoy this dish. In fact, it seemed a bit heavy on the MSG, which would explain the intense flavours. On the topic of greasy, the 4 Seasons Green Beans were crying out for some Oxy. 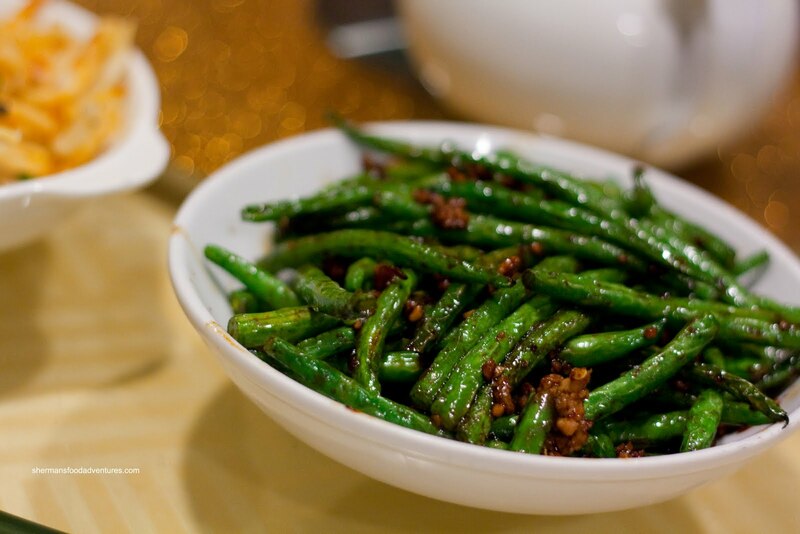 Well, it was expected since restaurants typically deep fry the beans first before stir-frying. The beans turned out to be a little overcooked; but once again, there was great flavour and good caramelization. 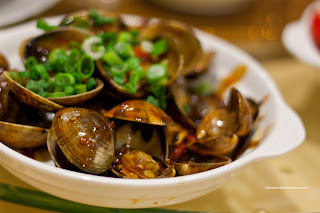 Emilicious ordered the Black Bean Clams and frankly, I'm not a huge fan of ordering this in a restaurant. It's not that I don't like it, I just find that there is not a lot of food for the price. The dish ends up to be mainly shells and a few precious pieces of clam meat. With that being said, I really like this dish otherwise. In fact, I made it at home recently, for roughly the same price; but with 3 times the amount. I know, I know, a restaurant needs to cover their overhead and operating costs... Anyways, this dish was prepared correctly with every shell open. The black bean sauce was thick enough and exhibited that salty garlicky flavour we look for. 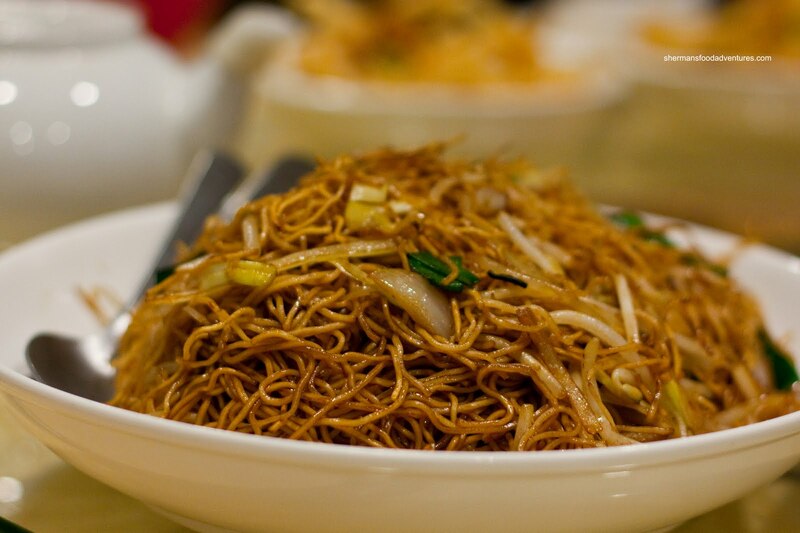 Gordo ended up selecting the biggest dish of the meal with the Soya Fried Noodles. Once again, this was greasy. 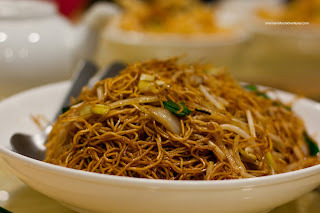 However, this dish is supposed to be somewhat greasy otherwise the noodles would stick together and the wok as well. Other than that, the noodles were pretty good with a chewy texture and good caramelization. 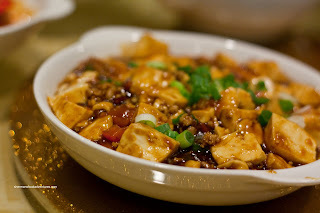 The last dish was Mo Po Tofu. This is usually better with rice; yet both Gadget Girl and Sweet Tooth both wanted to order it. Hey, we can make any food work for us! It just became mo po tofu congee, which was actually quite tasty. In addition to being tasty, the tofu actually had quite a kick. The first bite was pretty normal and then the heat kicks in. We liked how they were not conservative with the spice. Lastly, the tofu itself retained its shape and integrity, even after we picked it up. Okay, I realize that da laang is not supposed to be a filling meal. After all, it is a form of late night tapas. However, for the prices, I felt that the dishes were meager in size. Furthermore, the use of grease here is horrendous. 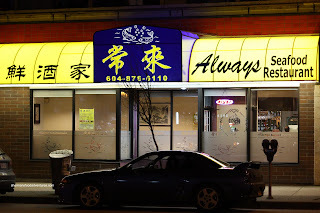 Add a huge dash of MSG and we have a prototypical greasy Chinese joint. I'm not sure of their regular dinner service; but if this is any indication of their food, it is a bit troubling. I realize that Chinese food ain't exactly the healthiest thing out there. With that being said, liberal use of oil and salt/MSG turned me off.